(April 21, 2008) – As Americans continue to overload their schedules, it is no surprise we are spending less time on lunch than ever before: According to a 2007 Information Resources, Inc. Consumer Snacking Study, nearly two-thirds of us are skipping or multitasking during lunch. For consumers striving to lead a healthy lifestyle, four simple changes to your daily routine will improve your midday eating habits, resulting in a healthier lifestyle and improving the quality of your day. • Plan Ahead: Packing a lunch the night before can save you time, money and empty calories. Plan each week’s lunches ahead of time to ensure your meals are as delicious as they are nutritious. For inspiration, check out the meal options at www.alpinelace.com. • Read the Label: Don’t be fooled by reduced-fat foods that are actually high in sodium or lacking in nutrients. Alpine Lace® Reduced Fat Deli Cheeses contain 25 percent less fat and 25 percent less cholesterol per serving than regular cheeses. Alpine Lace® Reduced Sodium Muenster Cheese is 25 percent lower in sodium per serving than regular cheese. • Pay Attention to Portions: Research from the National Center for Chronic Disease Prevention shows that portion sizes have increased in the past two years, with people inadvertently consuming more calories when faced with larger portions. Check out the serving sizes when purchasing reduced fat foods and ensure you aren’t getting more than you expect. Alpine Lace® Deli Cheese’s newlyreconfigured slice size will help consumers choose the portion that works best for their lifestyle. • Snack Smart: Bring healthy snacks to eat throughout the day, such as apple slices and Alpine Lace® Deli Cheese. If you tend to snack at home, cut up and refrigerate snack-sized portions of your favorite healthy foods so they’re just as convenient as the calorie-rich packaged snacks timecrunched consumers may gravitate towards. A great lunch option to add to sandwiches and salads, Alpine Lace® Deli Cheese is available in major food retailers nationwide for slicing at the deli counter or convenient, 8-oz. pre-sliced packages in the self-serve section of the deli. Look for the flatbreads in the bread aisle or near the deli. Using a vegetable peeler, peel 6 thin lengthwise ribbon-like slices from cucumber. Set aside. Combine sour cream and garlic in small bowl. Spread 1 side of each flatbread with sour cream mixture. Top each flatbread with 1/2 cup spinach leaves, 3 ounces turkey, 2 slices cheese, half of carrot, half of bell pepper and 3 cucumber slices. Roll up starting at 11-inch side; cut each wrap in half. Secure with toothpicks. Provolone cheese is mixed with a variety of vegetables and tossed with a vinegar-based salad dressing in this easy salad. Whisk together vinegar, lemon juice, garlic, olive oil and salt in large bowl. Add all remaining ingredients; toss to coat. Cover; refrigerate for at least 1 hour to allow flavors to blend. Alpine Lace® Deli Cheeses are manufactured to exacting standards: The cheeses are made without preservatives, contain 0 grams of trans fat, are a good to excellent source of calcium per serving, and are a good source of protein per serving. Alpine Lace® Deli Cheese comes in an array of popular varieties, including Swiss, American, Cheddar, Co-Jack®, Provolone, Muenster and Mozzarella. Suggested retail price for pre-sliced and slicing cheese is $4.49 for 8 oz. and $7.99 per pound, respectively. 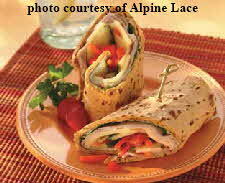 Visit www.alpinelace.com for delicious recipes and tips for healthier lifestyles.